See You in Hell, Winter! This Sunday, May 20, three of our favourite wine agencies are joining forces with one of our favourite food purveyors to hold an event at one of our favourite venues. 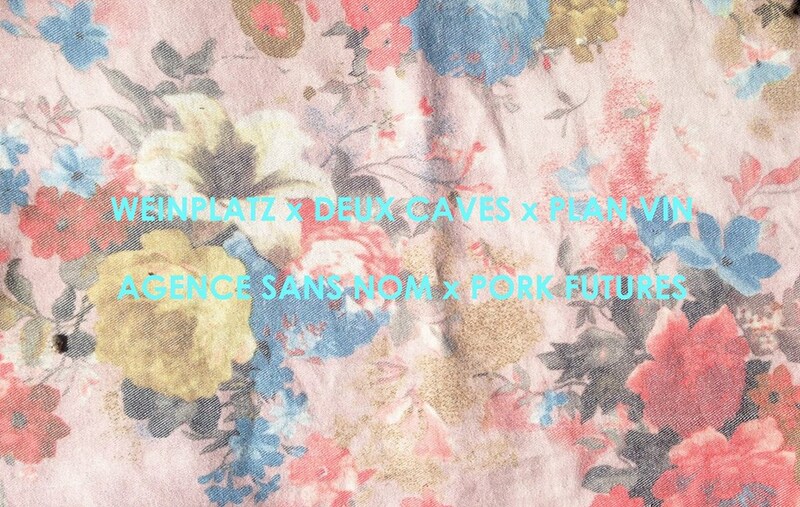 Specifically, Deux Caves, Plan Vin and Agence sans nom (aka Vadim Fonta) will be pouring two wines each while the Pork Futures guys will be serving grilled sausage sandwiches (buns by Automne) at Alexandraplatz (6731 de l’Esplanade) between 4 p.m. and 11 p.m. Among the imbibables will be a Beaujolais from Kéké Descomes, a skin-contact Riesling from Chanterêves, an orange wine and sparkling red from Vadim’s portfolio and a sparkling Riesling made just outside Champagne by Jacques Beaufort’s son. The agencies involved are waiving their fees, so glasses will probably run around $10. What’s more, the forecast is now for clearing skies and mild temperatures. Dolceacqua is a commune and village in western Liguria, just inland from the Mediterranean and touching the border with France. It is also a DOC for red wines made from the Rossese grape. The DOC’s annual production averages a mere 1,500 hectolitres. Founded in 1961, Testalonga is widely considered the top estate in Dolceacqua. Its owner-winemaker is Antonio Perrino, now in his 70s and preparing for retirement (his niece Erica has begun assisting him and will eventually take over). The estate’s holdings total around one hectare of vines in small terraced plots on steep hillsides, like all the best vineyards in the appellation. Testalonga’s overlook the sea and are located a half hour’s drive from town. The vines average 35-45 years in age though some are as old as 100. 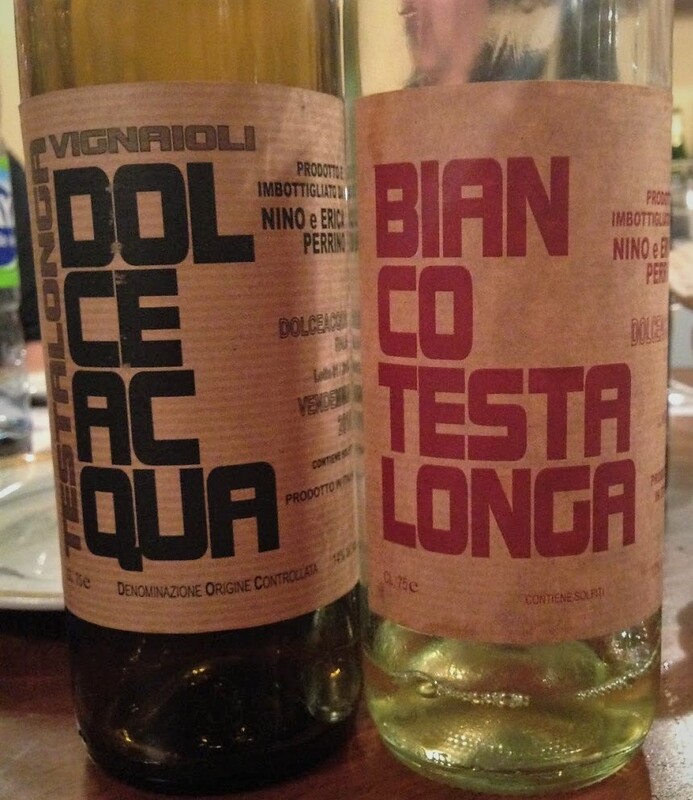 Two varieties are grown: Vermentino and Rossese. The farming is organic (uncertified) and the vineyards are worked manually. Harvesting is manual, too. The wine-making takes place in a converted garage in the centre of town. The wine-making equipment is pretty much limited to a vertical press and a couple of old large barrels. All fermentations are spontaneous. No temperature control is used. With total annual production typically being seven 600-litre barrels (five red, two white), Testalonga qualifies as a micro-producer. Antonio says he makes wines like his father made them and there’s no denying that have a rare timeless quality. 100% Vermentino. Macerated on the skins for five days. Matured in 600-litre old oak barrels. Unfined and probably unfiltered. 14% ABV. Total production: less than 1,000 bottles. Quebec agent: Deux Caves. 100% Rossese di Dolceacqua (aka Tibouren), nearly all of which comes from the Arcagna vineyard, considered one of the best in the appellation. Made using the whole clusters. Matured in 600-litre old oak barrels. Unfiltered and unfined. Total production: around 2,000 bottles. 13% ABV. Quebec agent: Deux Caves. A historian by training, Grégory Leclerc did stints as a journalist and marketer before falling into the world of natural wine-making. He purchased his four-hectare estate – downsized from the original 6.5 hectares, named Chahut et Prodiges and located in Chargé in the hills near Amboise in the Tourraine – in 2007. He farms organically and makes wines from Chenin Blanc, Sauvignon Blanc, Gamay, Côt and Grolleau. The land is worked using a tractor, though Leclerc says he may switch to horses at some point. Harvesting is manual. Vinification of the reds involves placing the whole clusters in concrete tanks for two to three weeks with no punch-downs or pump-overs – a form of carbonic maceration, what? Pressing is slow and gentle. The wines are unfined and lightly filtered. No sulphur is added to the reds; a tiny amount is added to the whites at bottling. Anne Paillet, the owner-winemaker of Autour de l’Anne, is married to Greg Leclerc. In 2010, she decided to abandon her corporate career and become a natural winemaker. Wanting to make wines different from her husband’s, she has leased 2.5 hectares of biodynamically farmed vines from Languedoc winemaker Christophe Beau (Domaine Beauthorey in the Pic Saint-Loup region). Harvesting is manual and the grapes are vinified naturally, in concrete tanks with no added anything, in the Languedoc. Wanting to make wines different from your everyday Languedocs, she transports the just-fermented juice to Leclerc’s cellars in the Loire for malolactic fermentation, maturation, blending and bottling with no fining, filtering or added sulphur. 100% Gamay from 25- to 30-year-old vines grown on clay and limestone. Matured around nine months in fibreglass tanks. 12% ABV. Quebec agent: Deux Caves. 100% Côt (aka Malbec). 11% ABV. Matured in neutral barrels. Quebec agent: Deux Caves. The cuvée’s name, which translates as “Anne’s pot,” is a homonym of peau d’âne (donkey skin). 100% Cinsault from 22-year-old vines grown on limestone and red clay. Half the grapes are destemmed, the other half left as whole clusters. Semi-carbonic maceration lasts 12 days. Maturation lasts 12 months. 12% ABV. Quebec agent: Deux Caves. 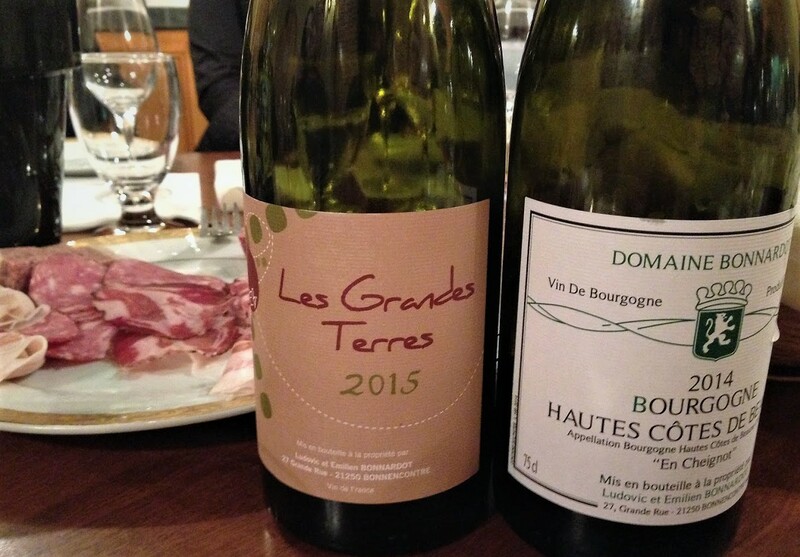 Based in Bonnencontre, Domaine Bonardot is sometimes referred to as Domaine Ludovic Bonnardot to avoid confusion with the Domaine Bonnardot based in Villers-la-Faye. Ludovic has been in charge of the estate since 2005, when he took over from his mother, Élisabeth. She founded the business in 1981 after studying oenology and apprenticing with Jules Chauvet. Over the years, she became interested in more natural approaches to farming and wine-making, an interest Ludovic shares, and it is under his watch that the estate has begun converting to organic. The 15-hectare estate has two operations: centred in Santenay, the wine-growing focuses on Côte de Beaune and Hautes-Côtes de Beaune appellations, while blackcurrants, aspaagus and grains are grown in Bonnencontre. 100% Chardonnay from a relatively high-altitude (440 m) parcel of 40-year-old substantially farmed vines near Orches. The soil is clay and limestone with pebbles and occasional rock outcrops. The grapes were manually harvested and the whole clusters direct-pressed. Spontaneously fermented in temperature-controlled conditions. Underwent spontaneous malolactic fermentation. Matured 12 months in 228-litre, fourth- to sixth-fill oak barrels and a further six months in stainless steel tanks. Clarified naturally, then lightly filtered before bottling with a small amount of sulphur dioxide (the only sulphur added during wine-making). 13% ABV. Quebec agent: Deux Caves. 100% Pinot Noir from organically and biodynamically farmed vines in the Santenay-Villages appellation (am unsure why it is declassified). The whole-clusters are spontaneously fermented and pressed when fermentation/maceration are complete. The wine is transferred to oak barrels for 12-18 months’ maturation. This is from Bonnardot’s natural line, so no added anything, including sulphur, and no filtering or fining. 12% ABV. Quebec agent: Deux Caves. Based in Savigny-lès-Beaune, the husband and wife team of Guillaume Bott and Tomoko Kuriyama founded Chanterêves in 2010. Both have a background in wine-growing, with Guillaume having worked at Étienne Sauzet before becoming the winemaker at Domaine Bize and Tomoko having studied oenology in Geisenheim before working at Friedrich Altenkirch in the Rheingau. Although they use only purchased grapes, they have their own wine-making facilities and hope to acquire some plots of vines. Their cellar practices tend to the non-interventionist, with an increasing reliance on whole-cluster fermentations. All fermentations are spontaneous; new oak is limited to the top cuvées and never exceeds 33%; fining is avoided; and sulphur use is minimized. 100% Chardonnay from organically and biodynamically farmed vines in a plot in the Hautes-Côtes de Beaune, just behind Saint-Romain. Fermented and matured one year in older oak barrels. Underwent malolactic fermentation. No stirring. Lightly filtered before bottling. 12.5% ABV. Quebec agent: Deux Caves. 100% Chardonnay. Vinification as for the 2014. 12.5% ABV. Quebec agent: Deux Caves. 100% Pinot Noir from sustainably farmed parcels in Puligny-Montrachet and Paris-l’Hôpital (Maranges). This was Chanterêves’ first whole-cluster, nearly sulphurless cuvée. Given four weeks’ maceration in a wooden tank with no pump-overs but six post-fermentation punch-downs. Matured 10 months in older oak barrels. Racked once before bottling. Unfiltered. 12.5% ABV. Quebec agent: Deux Caves. 100% Pinot Noir. Vinification as for the 2014 except slightly more sulphur dioxide was used at bottling. 12.5% ABV. Quebec agent: Deux Caves. 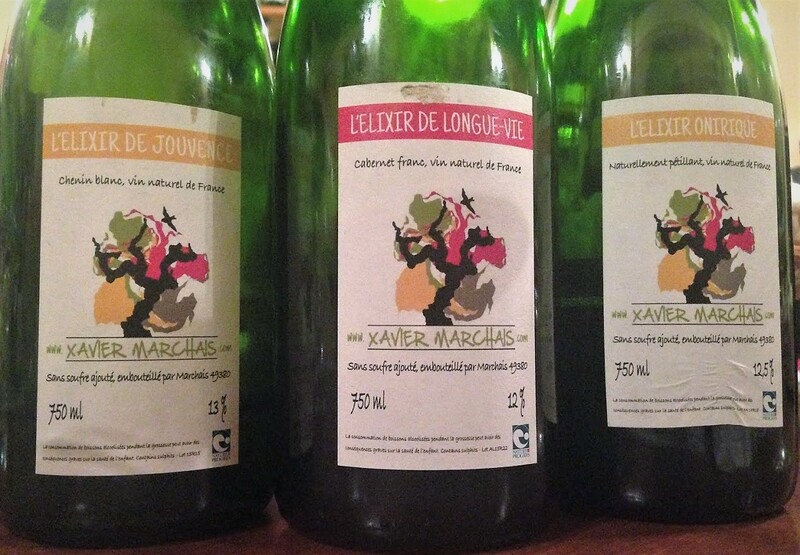 The Mo’ Wine Group’s second February tasting was led by agent Max Campbell and devoted to private imports represented in Quebec by Deux Caves, one of which caves Max is. We began with three wines from an under-the-radar artisanal vintner whose wines had impressed us back in 2015. In 2010, Xavier Marchais abandoned his career as a computer engineer and moved to Faye-d’Anjou to begin life as a winemaker. His four hectares of vines (half Chenin, half Cabernet Franc) are farmed biodynamically using a horse and manual labour. Pesticides, herbicides, fertilizers and other synthetic products are systematically avoided. The wine-making is non-interventionist. For the Elixir cuvées, fermentation (with indigenous yeasts) and maturation take place in used barriques. Cellar techniques are pretty much limited to crushing and punching down by foot, manual pressing and racking. No sugar or sulphur are added. The unfiltered and unfined wines are bottled by hand and closed with a crown cap (the still red’s cap reportedly allows more oxygen exchange than the still white’s). 100% Chenin Blanc grown on schist. Matured 12 months. Crown-capped. 13% ABV. Quebec agent: Deux Caves. 100% Cabernet Franc grown on schist and spilite. Matured 12 months. Crown-capped. 12% ABV. Quebec agent: Deux Caves. A red pet-nat (ancestral method sparkler) of Grolleau (70%) and Cabernet Franc (30%). Matured 12 months in barrel, six month in bottle. No dosage (the residual sugar remaining in the bottled wine ferments, producing the carbon dioxide that sparkles the wine). 12.5% ABV. Quebec agent: Deux Caves. Kewin “Kéké” Descombes is the son of renowned winemaker Georges Descombes and half-brother of Damien Coquelet. He made his first wine under his own name in 2013, when he was 21. His approach is similar to his father’s (organic farming, semi-carbonic maceration, indigenous yeasts, minimal or no sulphur). The wines appear to be popular in Japan. 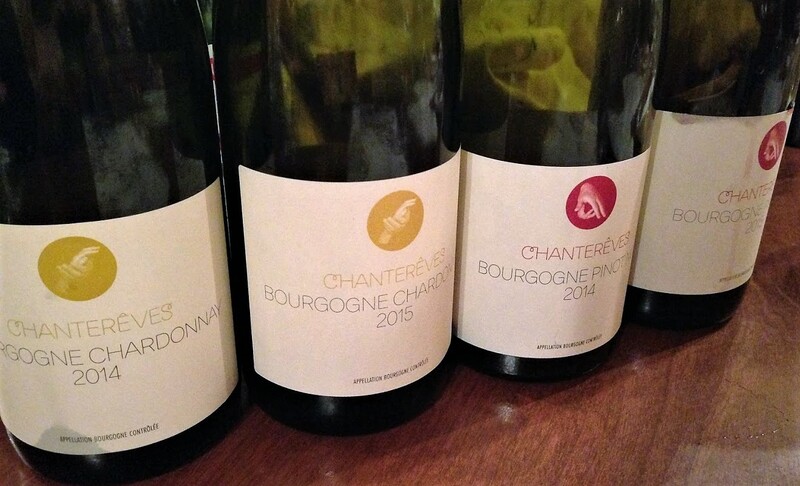 The three we tasted are currently sold out in Quebec though a second shipment is expected this spring. Son of Jean-Paul Thévenet, one of the “Gang of Four” winemakers who spearheaded the natural Beaujolais movement, young Charly Thévenet worked at his father’s and Marcel Lapierre’s wineries before acquiring a parcel of old Gamy vines in Régnié. His first vintage was the 2007. 100% Gamay from organically farmed vines grown in sandy soil in a 1.2-hectare vineyard in the commune of Corcelles. Fermentation lasted 15 days. 11.5% ABV. Quebec agent: Deux caves. 100% Gamay from organically farmed vines. 12.5% ABV. Quebec agent: Deux caves. 100% Gamay from organically farmed vines. 13% ABV. Quebec agent: Deux caves. 100% Gamay from 80-year-old biodynamically farmed vines grown in a 3 ha vineyard with granite soil. The grapes are manually harvested as late as possible and aggressively sorted, the idea being to have very ripe and impeccably clean fruit. The clusters are fermented whole with indigenous yeasts. The wine is matured on its lees in neutral Burgundy barrels. No filtering or fining. Use of sulphur dioxide is kept to a minimum. 13% ABV. Quebec agent: Deux caves.